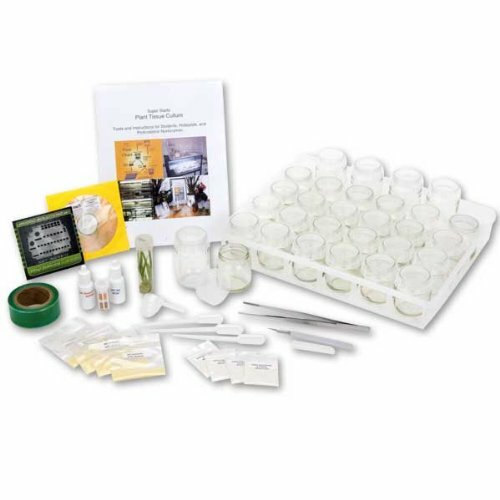 Super Starts Complete Plant Tissue Culture Kit by iGrowNW.com at Enria Industries. Hurry! Limited time offer. Offer valid only while supplies last. With Plant Tissue Culture you can grow your favorite plants in small glass and plastic containers in very small areas, saving space and light. With Plant Tissue Culture you can grow your favorite plants in small glass and plastic containers in very small areas, saving space and light. Imagine cutting parts from your favorite plants and seeing them generate fresh shoots and roots before your eyes. A piece of Begonia leaf begins to grow new plants all over it soon after being placed in the growing media. The new plants explode with bushy growth energized by the sugar and hormones. In commercial applications, roses are flowered in tissue culture and orchid growers use tissue culture to speed up new growth of their valuable new breeds. Universities and research companies maintain expensive laboratories for multiplying their valuable plants and exposing their hidden genetics. Now you can employ these same techniques at home! Imagine cutting parts from your favorite plants and seeing them generate fresh shoots and roots before your eyes. A piece of Begonia leaf begins to grow new plants all over it soon after being placed in the growing media. If you have any questions about this product by iGrowNW.com, contact us by completing and submitting the form below. If you are looking for a specif part number, please include it with your message.